The researcher pointed to the importance of extracting information from CVs in activating and accelerating the automatic screening of candidates, and the process of directing resumes towards the functional categories affiliated with them and arranging them automatically according to their fulfillment of the job announcements’ requirements. In her research, she proposed an electronic recruitment system based on a unified database for implementing terminological classification for CVs and recruitment announcements. The proposed system reconciles CVs and job advertisements that only falls within the relevant professional and functional categories, to reduce the needed time to reconciles the resumes and related job announcements. The researcher conducted several tests using a range of job advertisements and CVs. Then the efficiency and effectiveness of the proposed system were evaluated through comparing it to online recruitment systems, and the results published in two international conferences in 2017. 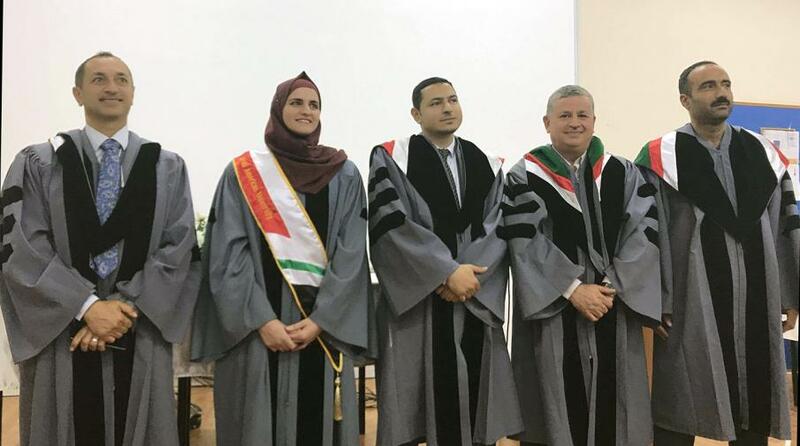 In the end, the committee composed of the thesis main supervisor and the committee chairman Dr. Mohamed Mari, co-supervisor Dr. Moth Sabha, the Arab American University internal examiner Dr. Rami Hadarb, and the external examiner from Al-Quds University Dr. Rashid Jayousi, decided to give the student Abeer Zarour a master degree.